There’s nothing quite like picking up a book you’ve never heard of and know nothing about and discovering that you’ve stumbled across a classic. 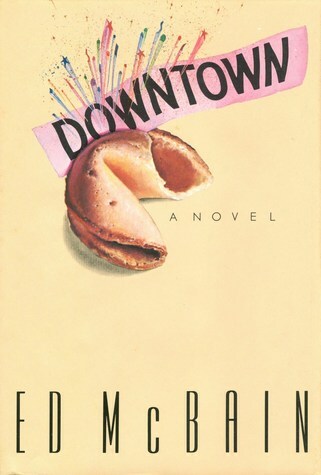 This was my experience with Ed McBain’s Downtown*. A classic? Strong words, there, Trent. But I mean it. 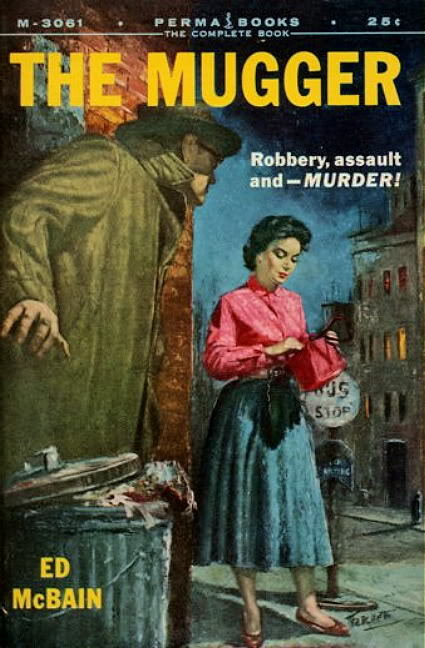 I just recently read The Hot Rock, which I loved and which is considered the classic comic crime novel. Downtown is nearly if not just as good (although very different). Our protagonist is Michael Barnes, an orange-grower from Florida who is about to fly out of New York City on Christmas Eve after a meeting with his advertising agency when he gets hustled by a gorgeous woman and her fake police detective accomplice in an airport bar. His drivers license, credit cards, and money now gone, he goes downtown to report the crime to the police, getting his rental car stolen along the way. From there, he ends up on the lam accused of murder, running hither and thither meeting all sorts of strange people and ending up in all sorts of strange situations as he tries to figure out just what the hell is going on. Tempering this craziness is the fact that Michael Barnes has some serious emotional baggage–he’s a cuckold and bitter about it, has issues with his mother, and was scarred by his combat experience in Vietnam (although he’s not an offensive psycho stereotype, thank God). These emotional scars are played upon masterfully by McBain, for dark humor or for grounding moments of pathos as appropriate, and they give Downtown a humanity that makes the whole farce unexpectedly powerful. I don’t know why Downtown isn’t better known. Maybe Ed McBain just pumped out so many books that lots of his stuff falls through the cracks while readers get stuck trying to read the 87th Precinct and Matthew Hope novels in order. Maybe it’s because nobody made a movie out of it (although see below). Maybe, and this is a strong possibility, the style of humor doesn’t appeal to a broad enough audience. Whatever the reason, Downtown deserves much better than obscurity. It’s clever, witty, touching, and terrific.